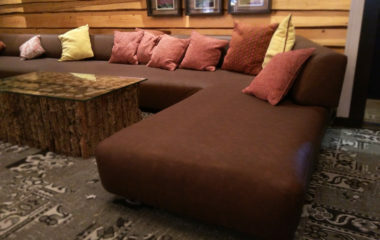 Onsite commercial upholstery services for restaurants. Whether your restaurant needs a remodel or regular maintenance. We have the tools and knowledge to get and keep your restaurant looking amazing! Craftsmanship with attention to detail. All our techniques and materials are aimed at providing a beautiful product that can stand the test of time. Even things as simple as the thread we use and the way in which the vinyl is folded and stapled make a difference. Efficient service for medical facilities. Our scheduling allows us to come in before open or when things are slow to complete work, so patrons and operations are never inconvenienced. By using the best materials and tried and true techniques we provide the ultimate in quality which is sure to stand up against the toughest heavyweights. We know that durability and sustainability are key to your business success! Our service and materials always aim to increase durability. We bring the shop and service to you! No more sending equipment out for days on end, we come to you and get the work done in minutes. 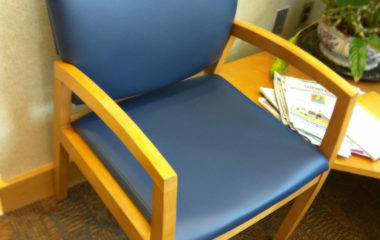 Don’t wait days or weeks for your equipment or seating to be reupholstered. We complete service within minutes or hours. Three words: Fast. Efficient. Convenient. 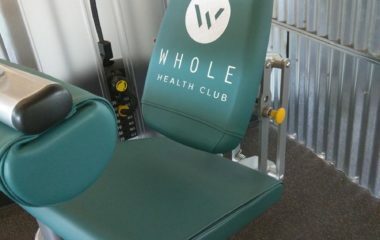 You thrive on offering your customers a comfortable environment in which to improve their health, work out, have fun, and relax. We respect that – which is why we’ve been servicing fitness centers for over 16 years. We’re fast. Our technicians are always working hard with an eye for detail that only comes from experience. We’re efficient. From the moment we step in the door, you’ll benefit from our service methods that keep our time at your facility to a minimum. We’re convenient. Our unique service is mobile. You don’t have to bring your equipment to us: we come to you. Our self-contained truck is fully equipped to service any of your upholstery-related needs. You’ll find our friendly, uniformed, employees will service your facility so seamlessly and quickly that your customers will barely notice. You know each of your customers has certain expectations that must always be met, and you work hard to meet them. The same holds true for our service. Exceptional craftsmanship: We always aim to provide a product that’s better than the original. The seats your patrons enjoy are a primary part of the restaurant environment, and we respect that, taking care to create a quality product. Friendly service: Your patrons won’t likely notice that we’re even there, and if they do, they’ll receive the same friendly courtesy you expect from your own staff. Clean work area: All work is done on-site in our self-contained truck, out of sight and out of mind of your patrons. We always leave the site cleaner than when we found it. Your success is our success. Your patients depend on you. Our goal is to keep your equipment in top shape so that you can provide the best treatment. 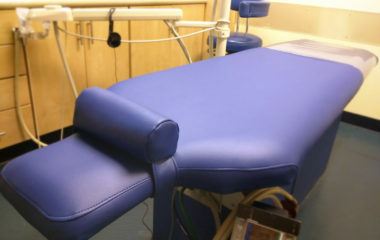 Advantage has been servicing medical facilities of all kinds for over 10 years. Our regular customers depend on our discrete, uniformed employees to work quickly while providing the utmost care in servicing their exam tables, exam chairs, and other vinyl and fabric-covered surfaces – even your lobby chairs! With a limited number of exam or adjustment tables and a waiting room full of patients, time is of the essence! With that understanding, we will work around your schedule to keep your facility running as smoothly as possible. We also offer a wide range of commercial grade upholstery vinyl and fabric in hundreds of colors – allowing you to select a color that fits your office best! Ultimate in quality. Ultimate in convenience. The waiting room of your office or place of work is one of the first things your clients or customers see. First impressions are important. Our goal is to make sure that your waiting room communicates the kind of professionalism you do, and that your clients or customers don’t sit there thinking about the upholstery. Our uniformed employees are prompt and professional, and take special care to make not make any disturbance to your office, completing all work in a mobile, self-contained, truck that parks on-site. Make your office a welcome place! No matter what the challenge, Advantage is ready to serve. Over the last ten years, we’ve served our clients in a variety of extra-ordinary ways. If you have a large or unusual project, Advantage is here to help. From the vinyl-covered wall along the outfield of PGE Park in NW Portland to custom gym padding. If you have an upholstery-related problem, Advantage is your solution.